The CEO is supposed to be the chief employee, leading his or her organization to deliver on the agenda and objectives the Board of Directors has set. The CEO is an operating executive. The Chairman, on the other hand, is supposed to lead the Board of Directors in setting the agenda, strategy, and objectives of the corporation, in response to its employers, the shareholders, and all the other myriad stakeholders (employees, regulators, government officials, vendors, community members, and customers) which have a say or a stake in the activity of the firm. The Chairman and other directors of the corporation are stewards. They are not supposed to get down in the weeds, day to day, operating the various parts of the business. That is the CEO’s job. But as stewards they are supposed to think about the what-ifs, the perils and opportunities that may or may not confront the firm in the future, and the problems and threats which may be festering beneath the glittering surface of excellent corporate performance. One way of reading that is that the CEO goes to work every day to make money for the shareholders: his job is to increase net income. The chairman keeps an eye on those efforts, makes sure the creditors and community members and so forth aren&apos;t forgotten, and frets about the perils that the CEO ignores in his drive to just go make money. On this stylized description, you could imagine shareholders being very fond of the classic CEO, while finding the ideal chairman - a powerful check on the CEO&apos;s vision and an advocate for non-shareholder constituencies - to be a bit of a wet blanket. And you could imagine bondholders, say, or regulators, enjoying the moist, comforting embrace of said wet blanket, while finding the hard-charging CEO too much to take undiluted. The consensus around the JPMorgan shareholder vote is that lots of people think Jamie Dimon is a bit garbage as a chairman - he hasn&apos;t even pressed his CEO to develop a succession plan! etc. - while also being a near-ideal CEO. Which roughly maps to that constituency model: Dimon&apos;s so good for shareholders that he represents 10% of the value of their shares, supposedly, while on the other hand he&apos;s surpassed Lloyd Blankfein as the favorite villain of those worried about too-big-to-fail banks, risky prop trading, industry efforts to weaken banking regulation. But he convincingly made the case to shareholders that they could have him as both Chairman and CEO or as neither. Being shareholders, they picked a great CEO over a well-balanced governance structure with a good-enough CEO reined in by a powerful steward on the board.2 Why wouldn&apos;t they? It&apos;s worked so far. I wonder if the vote has gotten so much attention for another reason, which is that it’s easier to chew over Jamie Dimon than it is to think about the right structure for our financial system. Sure, the management, and the structure of that management, at JPMorgan matters. But if I were a conspiracy theorist ‑ and really and truly, I’m not! ‑ I might even suspect that all the fuss about Dimon is supposed to make us “watch the birdie.” It’s a distraction, meant to deflect attention from the real point, which is how we structure a financial system that best serves the needs of consumers and businesses in as safe a way as possible. One thing that makes it work well as a distraction is that you can talk about it in the terms that McLean goes on to use: Brown-Vitter! Too-big-to-fail! $8.5 billion in regulatory and legal settlements! JPMorgan as the poster child for financial-industry badness! Shouldn&apos;t someone be supervising the guy running all of that? 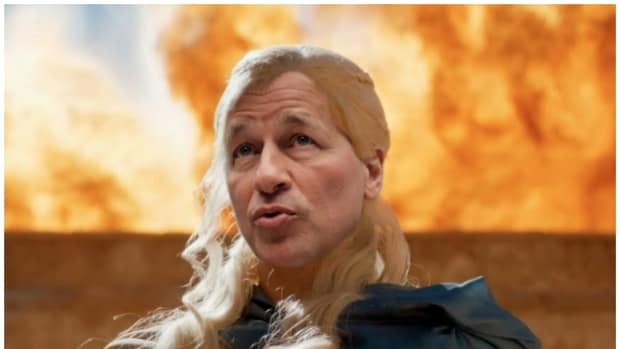 But then the ultimate decision on Dimon&apos;s role is made by JPMorgan&apos;s shareholders, and they more or less don&apos;t care about all that. Will you make us money, or not? That&apos;s not the question that McLean, or a lot of other people, want answered. But it&apos;s really the only question that JPMorgan voted on today. 1.Thus, e.g., occasional regulatory fondness for tying bankers&apos; fortunes to the fortunes of creditors rather than the shareholders for whom they nominally work. 2.And many shareholders who didn&apos;t vote for him, like CalPERS and CtW, are pretty stakeholder-y shareholders, managing union and public-employee money with an agenda that includes items other than "maximize returns."